The film begins with the news revealing that an Egyptian pyramid was stolen. When super-villain Gru (Steve Carell) hears of this, his pride is wounded and he plans to pull the biggest heist of the century by stealing the Moon. Gru tries to get a loan from the Bank of Evil (Formerly Lehman Brothers) and meets a young super-villain, Vector (Jason Segel), who annoys him. Bank president Mr. Perkins (Will Arnett) refuses to grant Gru the loan until he obtains the shrink ray necessary for the plan. Mr. Perkins tells Gru that he is getting too old and that new super-villains are younger and better, like Vector, who is revealed to be the one who stole the Pyramid of Giza. 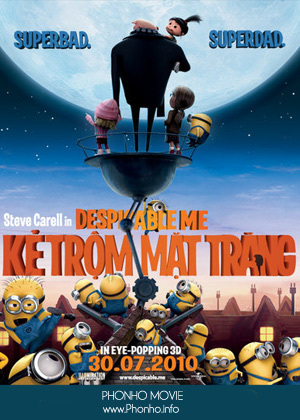 Gru and his minions steal the shrink ray from a top secret research facility in East Asia, but Vector steals it from him and shrinks his ship. Gru attempts to get the shrink ray back from Vector's lair, but all his attempts to enter the lair prove futile. After seeing three orphaned girls, Margo (Miranda Cosgrove), Edith (Dana Gaier), and Agnes (Elsie Fisher) enter the lair to sell cookies to Vector. Gru adopts the girls from Miss Hattie (Kristen Wiig), the head of the orphanage, to use them to steal back the shrink ray. Gru has his assistant Dr. Nefario (Russell Brand) build robots disguised as cookies. He then has the girls sell the robots to Vector, and the robots help Gru steal the shrink ray. On the way home the girls ask to go to an amusement park. Gru agrees, intending to leave the girls there. Instead, the attendant says he, as an adult, has to ride the roller coaster with them. Gru ends up having fun with the girls. Back at home, he presents his plan to Mr. Perkins via video. The girls keep interrupting him. Perkins again refuses to give him the loan, claiming that although he doesn't have a problem with the plan, he just wants a younger villain to do it instead. Gru has a flashback of his childhood, depicting his wanting to go to the moon after seeing the first moon landing. When he tried to impress his mother (Julie Andrews) with models of the rocket (and an actual working one), she just ignored him. Mr. Perkins calls Vector (revealed to be his son, whose real name is Victor) to the Bank of Evil to inform him that Gru has the shrink ray. Vector reassures his father that he will get the Moon. Gru almost abandons his plan due to lack of funds, but the girls and the minions take up a collection to keep it going.